One of the first drawings I did with S8i was this one. 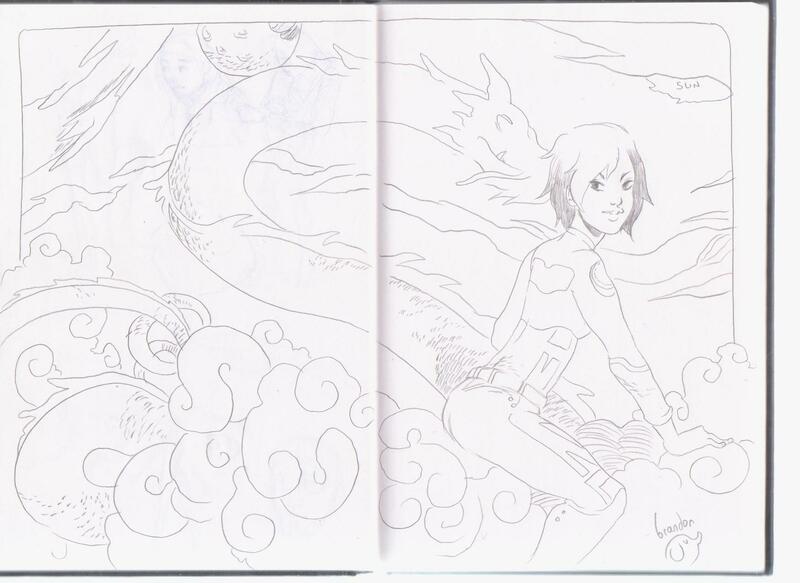 I sketched it out rather quickly in my booklet. It’s a small book I carry around with me all the time; you never know when a ‘good’ idea pops up. I’ll make a post on my booklet some other time. And below is a colored version. I have a lot of different versions. I cleaned the line art…which in GIMP means: erased all the stuff you don’t want to show. And I added color. 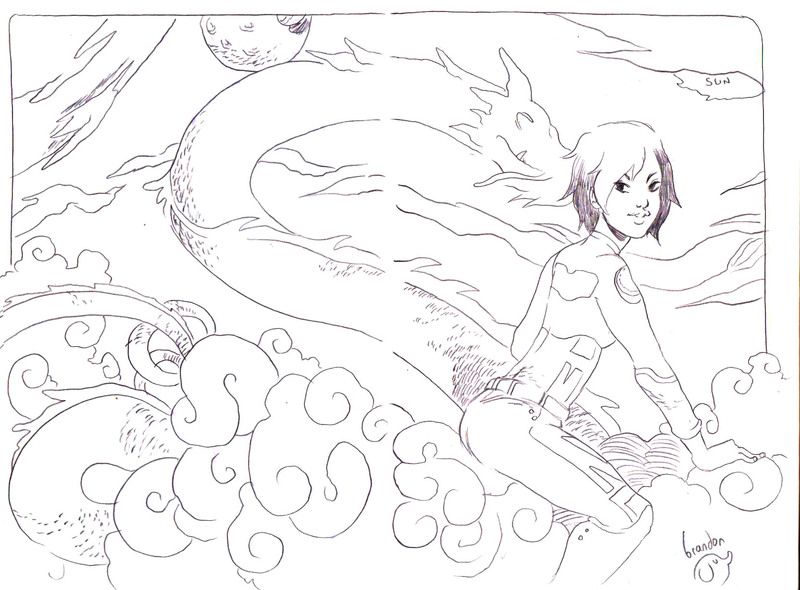 Hopefully in a way Brandon Graham does in his comics. 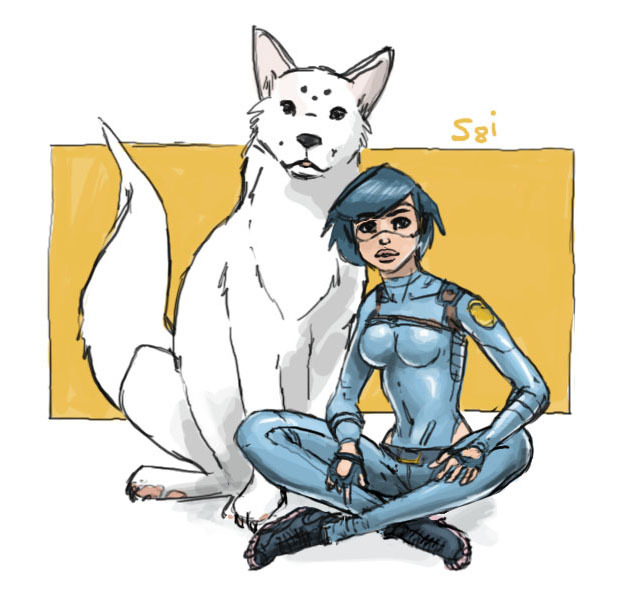 You can see his work here: Royalboiler. This one is inspired by the idea of becoming a father. So I started sketching as usual. And then add color. Oh..it’s the same person as this one. Not much to say this time. I tried to make a storyboard – untill this now is still the first scene. 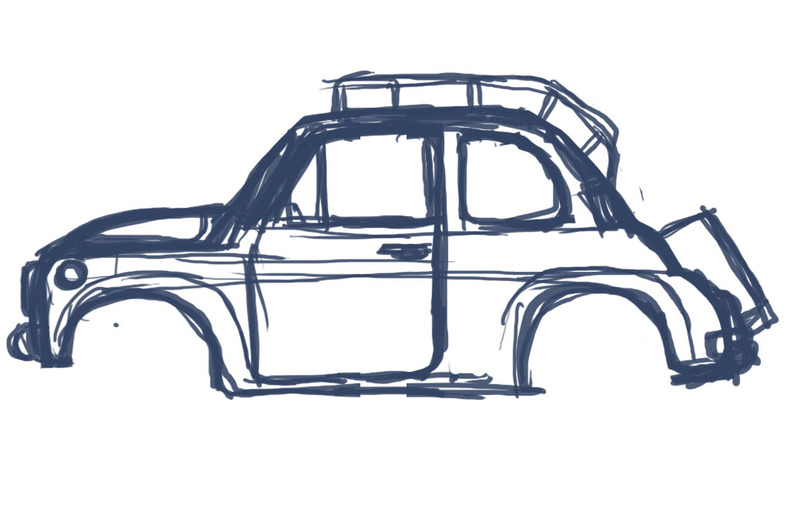 It will probably be altered several times before…I make it into an animatic. But for now this is it. Another weekly update. This one gave me trouble: somehow I couldn’t get her face correct. I’ll look if I can find some tutorials on drawing faces from multiple angles. And again a colored version. I changed some parts. 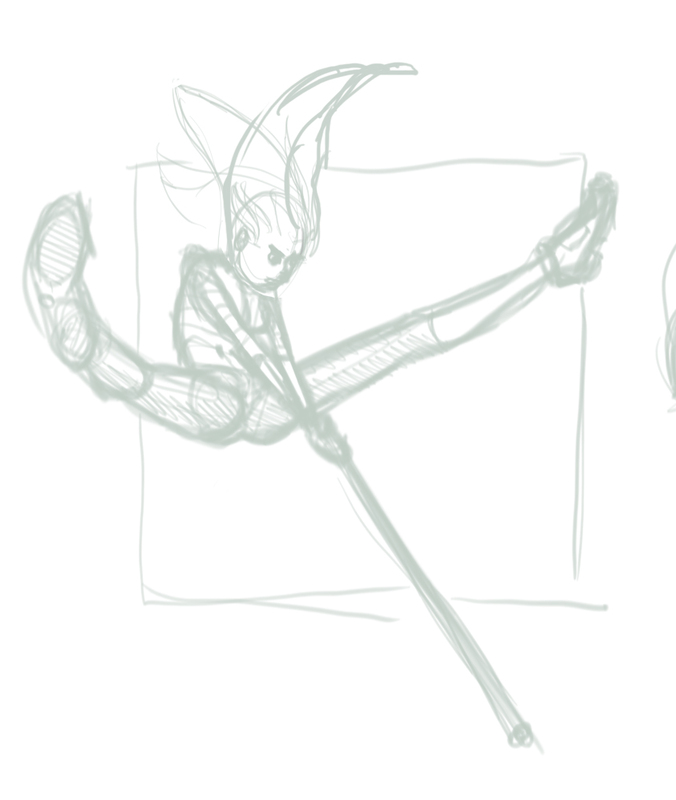 Made her bum smaller and repositioned her legs/feet. Because, well, because it looks more believable. 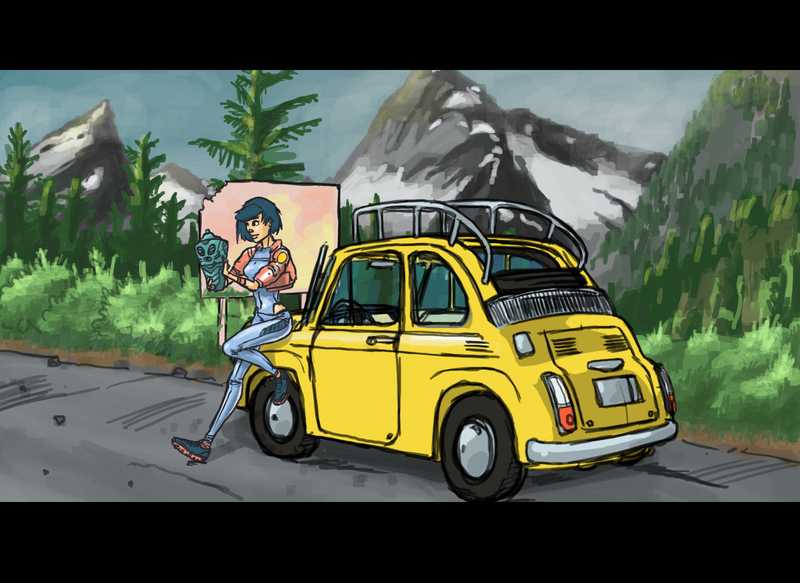 A drawing I made inspired by Hayao Miyazaki’s Lupin III: the Castle of Cagliostro. I’m trying to learn how to draw properly. 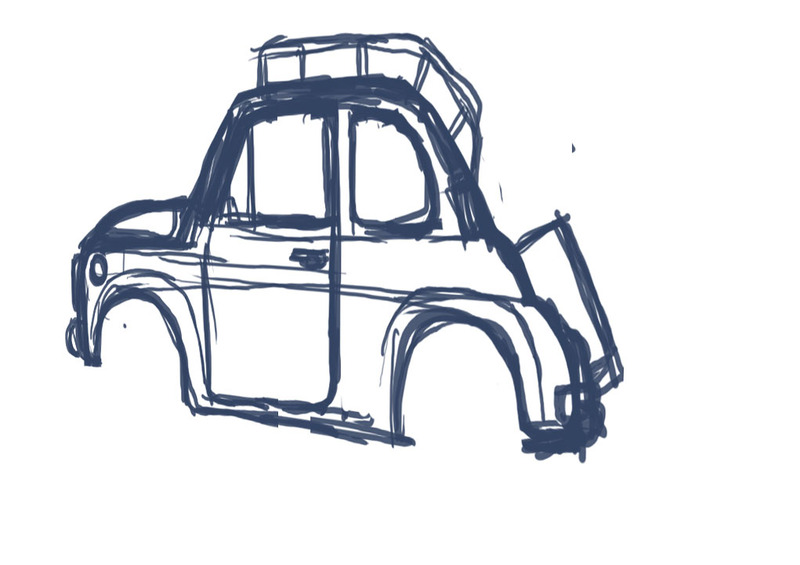 Have good character models, hard surface models (car), backgrounds and effects like smoke or clouds. Before trying to draw anything I like to know what I’m making. So I put my rough ideas on ‘paper’. Road, Car, mountains…note that I didn’t think about adding S8i untill later. Also the billboard is something I added in at a later stage. Her hair fell flat against the background so I had to frame it somehow. Of course an homage to Cagliostro. The chase scene in that cartoon is marvelous. Full of action, humor and consistent animation. 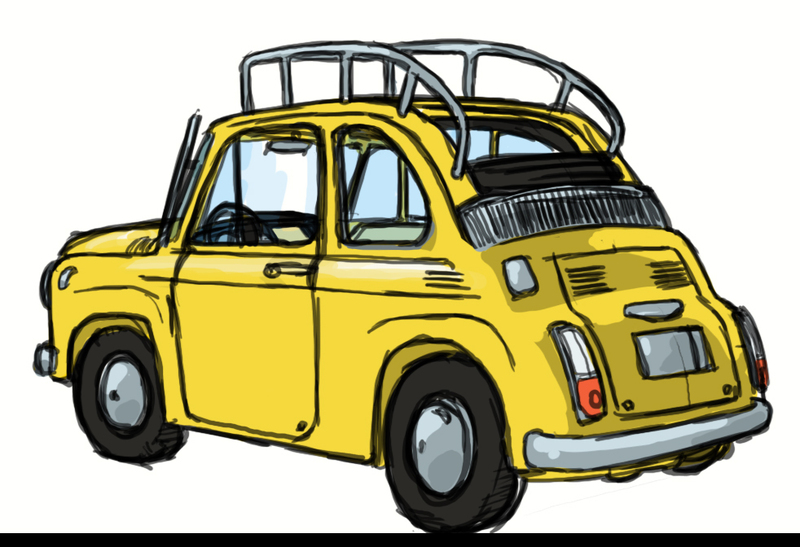 Hayao Miyazaki knows his vehicles; planes, cars and even walking castles. I used a method I learned from Thomas Romain. Known for the backgrounds in code Lyoko and Oban Star-racers. A couple of very nice animated series, especially Oban. I saw a post on Tumblr where he explained his workprocess. There is also a book on his work: ‘lost in animation’. The moment I know where and how to get is…I’ll update this post. He had some tips when you want to draw something ‘complicated’ in perspective. He started out by drawing the object from the side. 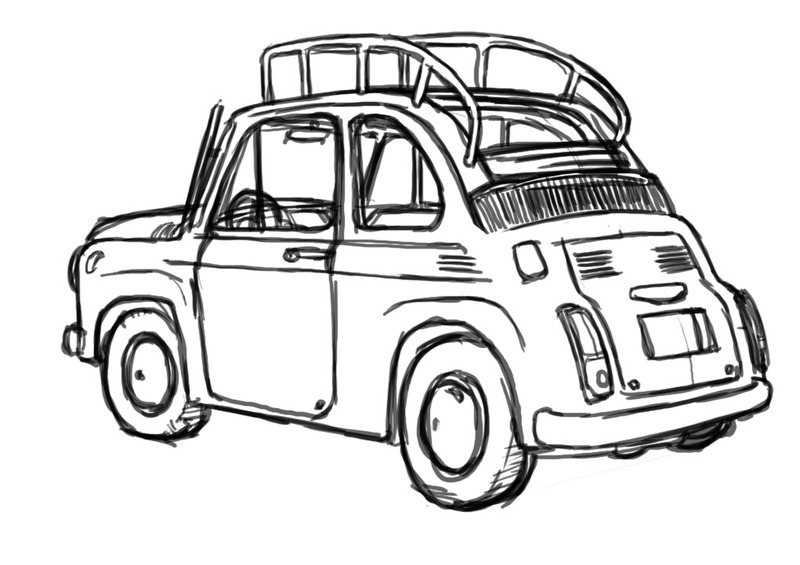 So there ya go, a Fiat500 from the side. Then he manipulated the image so it looked like it’s in perspective. Just screw, warp or change the dimensions. It’s really easy in GIMP, I guess same goes for other drawing applications. So…there ya go again. Of course this still isn’t enough. Next do the same thing with the other side (the backside). I have to admit; I was too lazy to do so. Besides I didn’t really think the backside was so complicated. 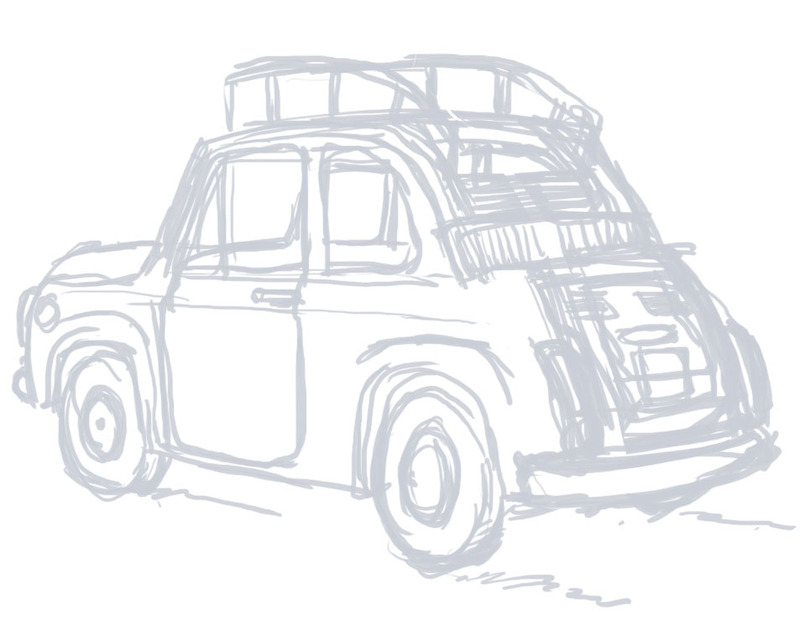 So I just sketched the entire car on top of this one. 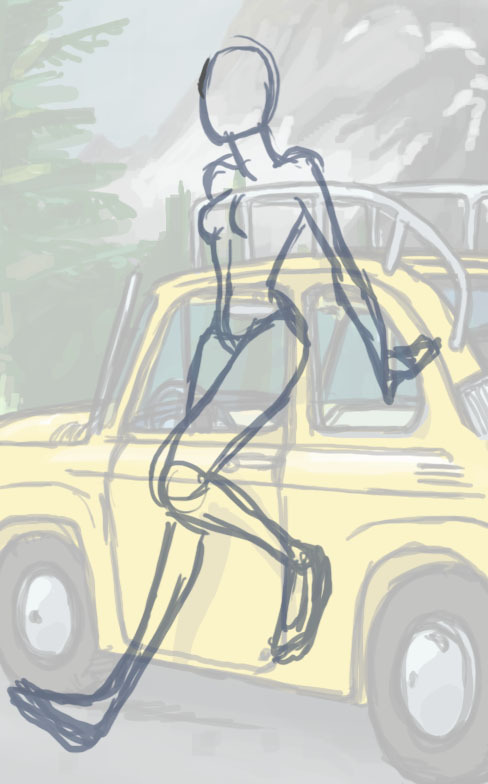 I always lower the opacity to so I can draw the ‘line art’ on a new layer on top, without being distracted too much. This layer is the definitive one. I like to keep my work a little bit sketchy. So much is lost in using perfect lines. In the end all the hardsurface elements will be made in Blender, but I want them to look like a 2d object. Maybe rotoscoping, maybe some good cellshaders. I really like the work of: Kazuo Oga known for a lot of the Ghibli movie backgrounds. Also a huge fan of the artwork shown in Rime. I’m still trying to figure out who is the one responsible for those great backgrounds. 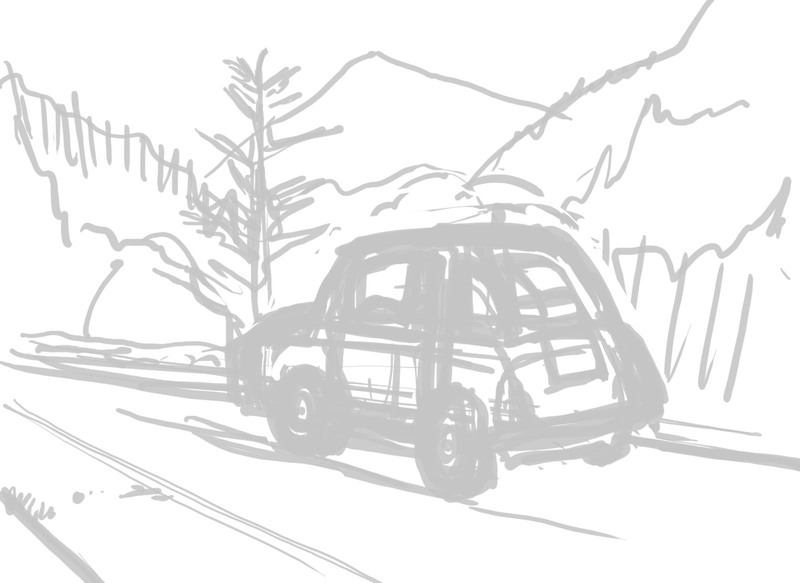 I can only say I still have a lot to learn about drawing backgrounds. The line-art is no problem for me. 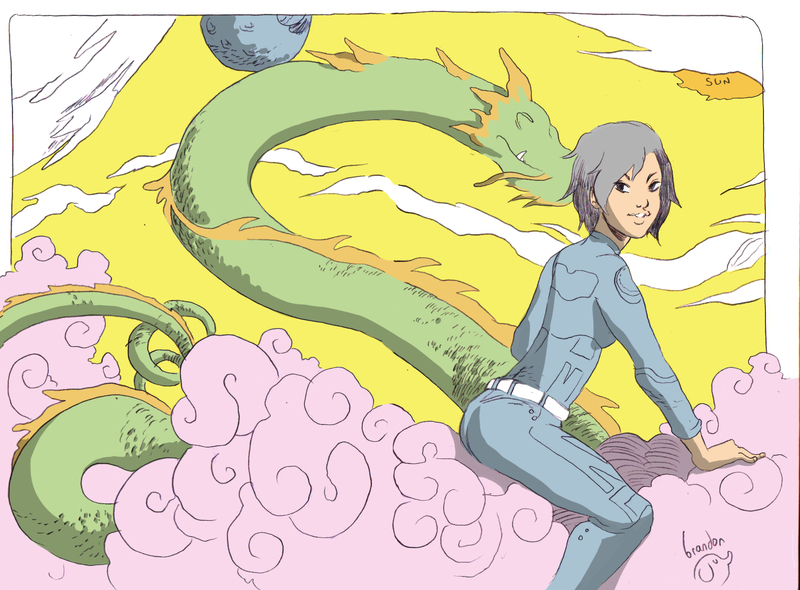 But coloring it, making it believable…THAT is the challenge. 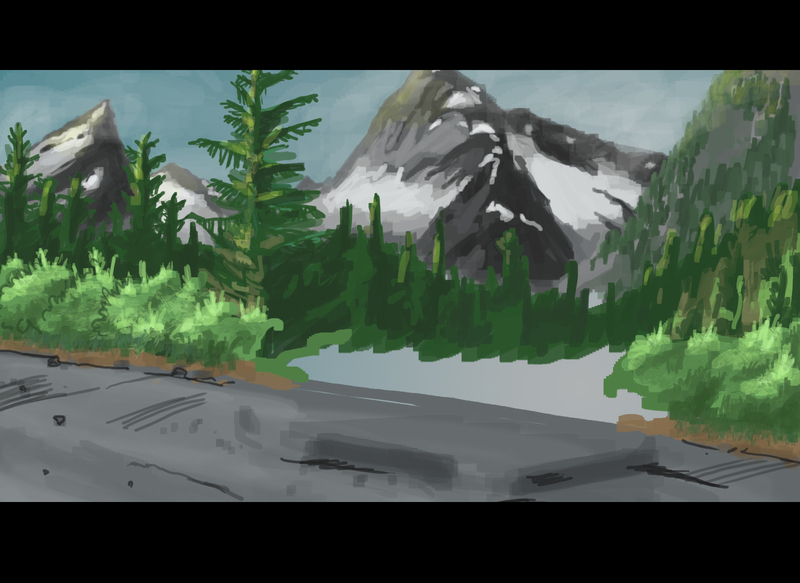 So this is a learning moment: I know I have to improve the way I draw trees, mountains…well backgrounds in general. The character was already designed. I drew these kind of clothes for the first time though, wanted to give her more of a vacation feel. Although it was somewhat difficult to find an interesting pose: I actually wanted to tell a story. Failed of course, and came up with a more traditional position. So here she’s just resting on the car. (picture of character in outfit, and color choices). But somehow It just doesn’t work. A: she’s too big. S8i wouldn’t fit into the car. B: it’s a bit boring. 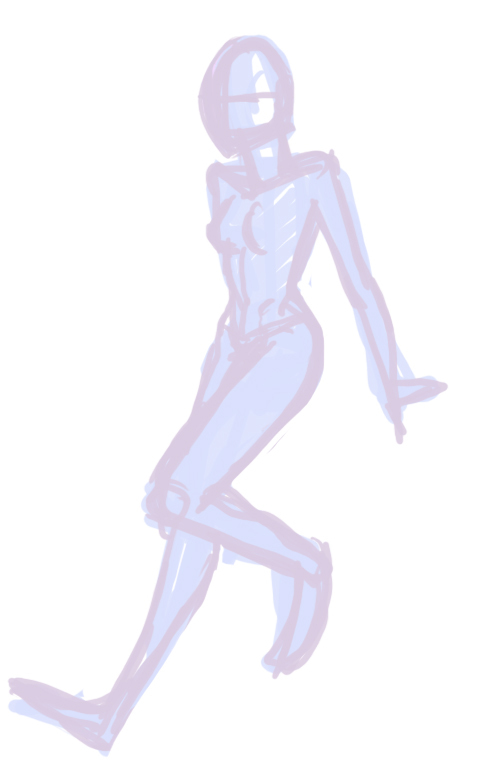 I always have the problem that I can’t spot the problem after I’ve drawn something. I have to step away for a couple of hours/days. OK I revisited the picture. 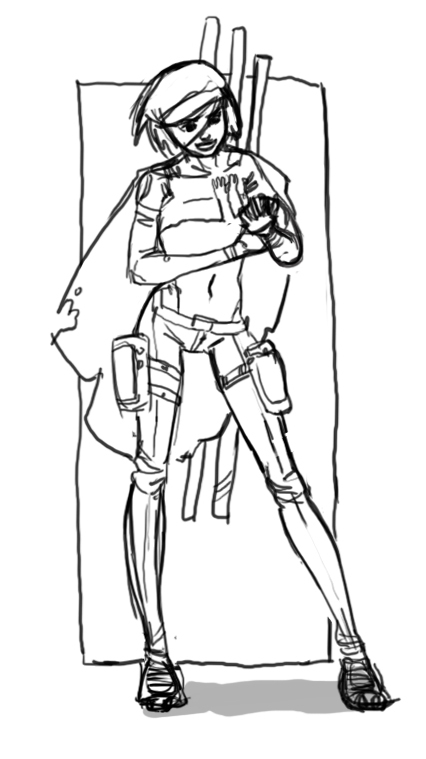 And yeah, she’s way too big, and I just don’t like her pose. She just stands there. Being observed. It feels wrong to me. That’s why I gave her something to carry, some idol she’s holding. But you already knew that. The picture on top is posed different, and she’s smaller. Hope you enjoyed my stuff. 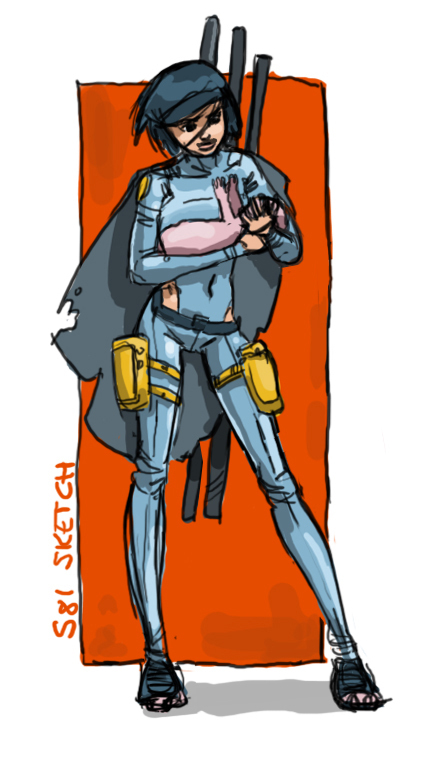 Sketch of S81 and her mutated dog-creature. 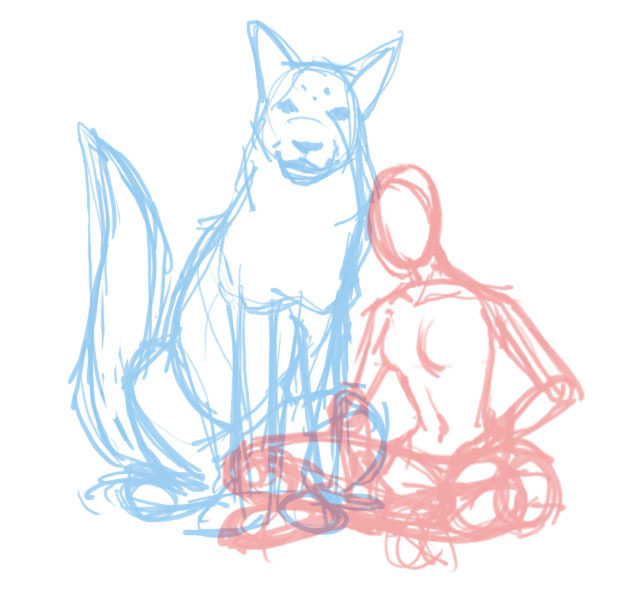 The dog is still nameless and without a final design. When sketching multiple characters I tend to use different colors. Because I’m easily confused. I grew up with a Canadian Shepherd. He was my bestest friend in the world. So I like to take the dog along on the journey. Storywise I’m not so sure yet, because the dog doesn’t have a special role to play, except maybe: make the other characters look more 3-dimensional. Give them someone to interact with. If you look carefully you can see I changed the angle of her legs. 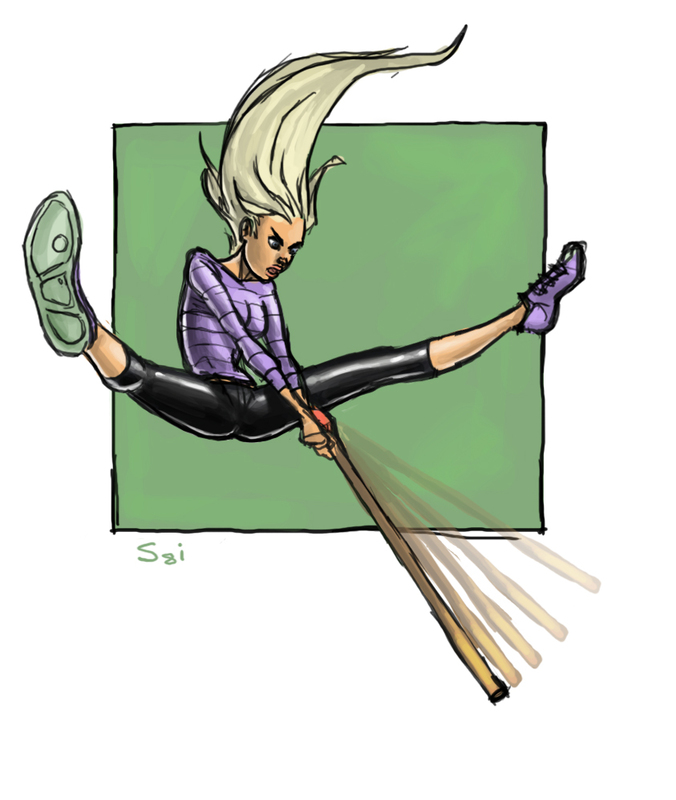 Her knees in the sketch are almost pushed to the ground. After drawing the lines this just didn’t look right. Last week I had a lot of problems with my computer…No internet. So no weekly update. I’ll make it up this week. This robot has some surprises which I’m not willing to disclose just yet. I designed this character with two purposes in mind. The first one being of course; to develop the S8i-storyline. The second purpose is to design a token for a game my oldest friend developed. A really cool two-player game, simple to set up, but with a lot of strategic possibilities. I need to create 3 different robots. 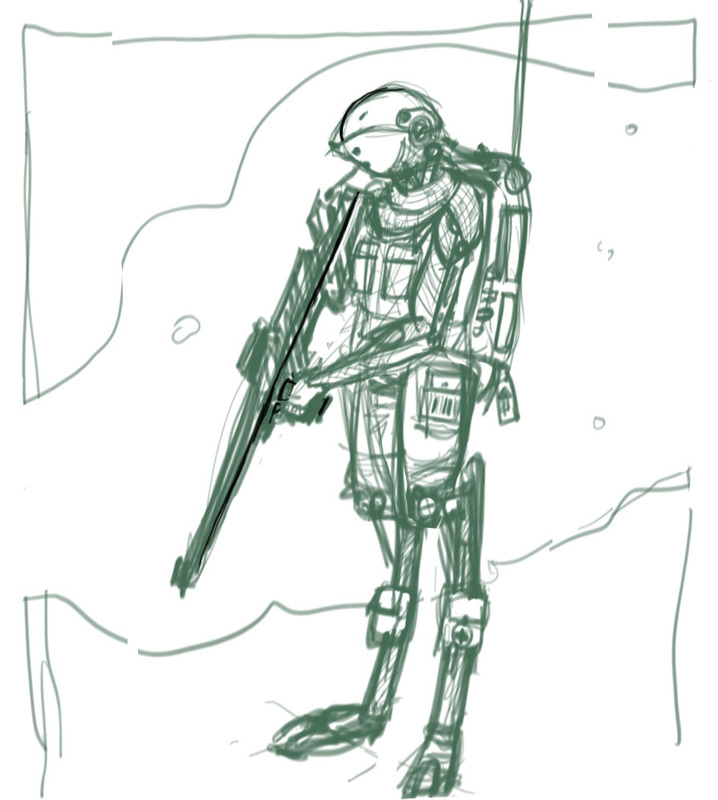 The head will be a little bit more menacing than this one…but the general idea will be the same. 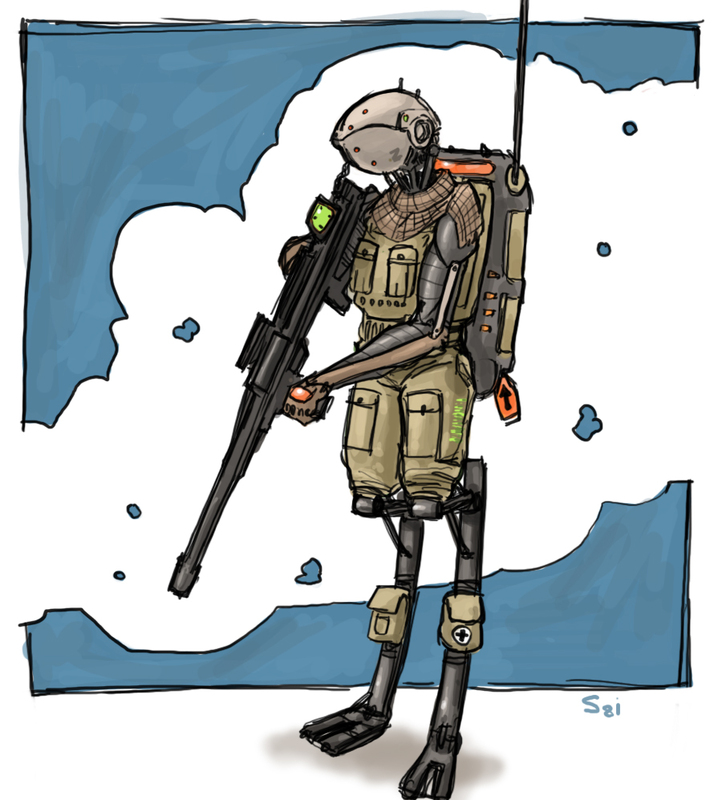 Same robot, this time colored. 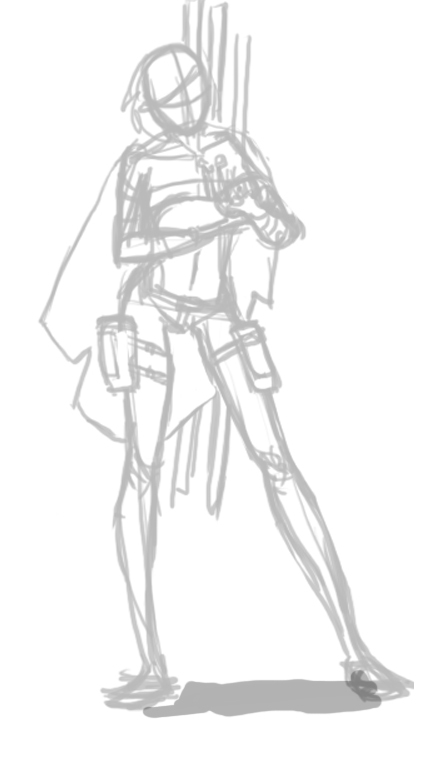 It’s in a desert outfit….nothing more really I want to say about him (or her) at this point.